My great-grandmother Gertrude was a strong woman. While I never knew her well while she was alive—she passed away when I was 9—family lore has kept her adventurous spirit alive. 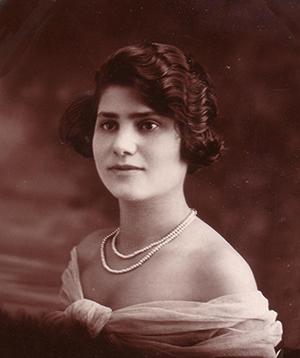 She was one of the first in my family to move from hostile Eastern Europe to America in the 1920s, creating a new life and branch of the family tree in the New World. Her towering presence explains why two children in our family are named after her: My rambunctious son Gidi and my sister’s little girl, Grace. Once in America, Gertrude brought a bit of the shtetl and a pinch of her own natural sass to Massachusetts. I was raised on stories of a stylish and iron-willed woman who made ends meet by selling knock-off patterns of Paris fashions. She was supposedly arrested once for loitering in front of stores on New York City’s fashionable Fifth Avenue as she sketched. She worked by day and studied English by night, yet all my relatives’ impressions of her are done in a thick Yiddish accent. We all refer to her as “Grandma,” because that’s what my Mom always called her. The way I find myself connecting with Gertrude is through baking. She was a great baker, and there are many recipes in family circulation that originated with her. Many were jotted down on my grandfather’s optometrist prescription pad by my mother, who as a teenager would sit by her as Gertrude baked, watching her add a little bit of this and a little bit of that. Looking at the smudged, handwritten recipes in my mother’s recipe binder, I wonder why I never hold onto sentimental family items, preserving them for future generations (note to self: Do this!). While I am all for maintaining tradition in a romantic sense, I also have a little voice inside me that screams, “Spruce it up! Make it your own!” And so, with great apologies to Gertrude, I set out to update her recipes for chocolate chip sour cream coffee cake and sweet noodle kugel. 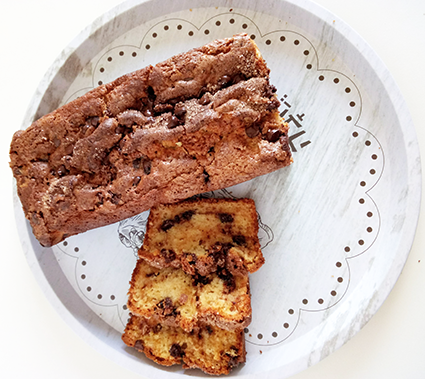 My mission was to make these treats just as moist and delicious a couple of days after baking as they do fresh from the oven. I also used the knowledge I gained from studying baking here in Haifa, adjusting to what is locally available in our supermarkets in Israel. Both recipes can be made well in advance and would make an excellent addition to your family’s break fast table this Yom Kippur. With wishes for an easy fast, and gmar chatima tovah from Haifa. Makes 2, 12-inch loaf cakes. This cake is a little bit richer than the average tea cake, so it should be saved for a special occasion. 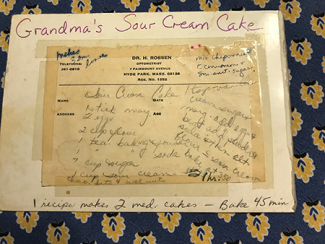 This cake differs from my great grandmother’s version in that I have played with some of the staple ingredient proportions and changed the preparation method. The result is a soft, ultra-moist cake with a light and luscious crumb topping. 1. Preheat oven to 350. Prepare two large 12-inch loaf pans by lightly brushing them with vegetable oil and lining the bottom and sides with parchment paper. 2. Mix together cinnamon and sugar in a small bowl and set aside. 3. Whisk together the flour, baking powder, baking soda and salt in a medium bowl and set aside. 4. Combine butter, sugar, oil and extracts in an electric mixer fitted with a paddle attachment and mix to combine. Add eggs one at a time to batter, mixing well between each addition. Add the sour cream and milk, mixing until fully incorporated. 5. Add the flour mixture and mix until combined. Batter should the consistency of a thick buttercream frosting. 6. Spread 1/4 of the batter into the bottom of each loaf pan then sprinkle with cinnamon sugar and a layer of chocolate chips. Repeat the process one more time—in both pans—using the rest of the batter and toppings. Bake for 55-60 minutes. Makes one 13 x 9-inch kugel. 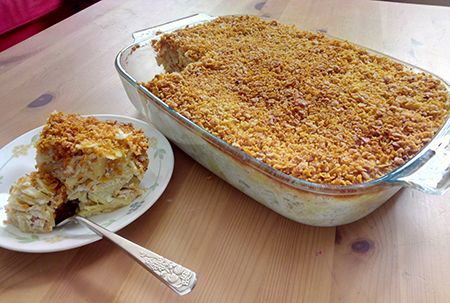 This kugel reminds me of my mother’s late-night, pre-Yom Kippur baking sessions followed by mornings shuttling off to temple (in red yarn tights, mind you). As a grown up, I have jazzed it up in my own way, sometimes adding tea-soaked raisins or grated carrots and sweet spices. I have replaced Gertrude’s Golden Grahams cereal topping with different breakfast cereals available in Israel (here I use Frosted Flakes), but feel free to use Golden Grahams if you like. As this recipe has passed hands over the years, it has been doctored and altered. Again, I have added some extra moistness by upping the sour cream content and punched up the flavor by adding touches of salt and vanilla. Apples and cinnamon replace the original pineapple and raisins. 1. Cook noodles per package instructions. When noodles are cooked, drain well and then place back in the pot. Add the butter and set aside for butter to melt and the noodles to cool. 2. Preheat oven to 350. Prepare a 13 x 9-inch casserole dish by lightly greasing with softened butter or cooking spray. 3. In a food processor, pulse together cereal and melted butter until you get a coarse crumb. Set aside. 4. Assemble the sweet cheese filling by combining the sour cream, cottage cheese, sugar, eggs, vanilla and salt. Add chopped apples and cinnamon, then stir to combine. 5. Combine the sweet cheese filling and the noodles; pour into prepared dish. 6. Sprinkle topping and lightly press it into the kugel. Bake for 55-60 minutes. If the kugel starts to brown too quickly during cooking, cover with foil. 7. Let cool completely, then chill before cutting. Serve cold or warmed in the oven.